Basel II or International Convergence of Capital Measurement and Capital Standards is a set of recommendations issued by the Basel Committee on Banking Supervision. Latest version of this standard is a comprehensive version from June 2006. It is a compilation of the June 2004 Basel II Framework, the elements of the 1988 Accord that were not revised during the Basel II process, the 1996 Amendment to the Capital Accord to Incorporate Market Risks, and the November 2005 paper on Basel II: International Convergence of Capital Measurement and Capital Standards: A Revised Framework. The purpose of Basel II is to create an international standard that banking regulators can use when creating regulations about how much capital banks need to put aside to guard against the types of financial and operational risks banks face. The following figure depicts the scope of application of this framework. 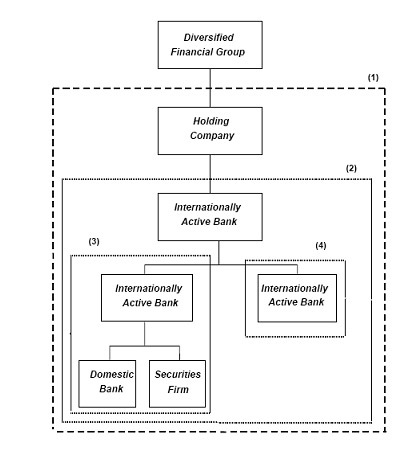 It shows that Basel II can be applied both at a level of banking group and at lower levels. The first pillar relates to calculating capital necessary for a given level of risks. Considered types of risks are: credit risk, operational risk and market risk. The first pillar provides several approaches for risk calculation, so that a bank can choose which technique shall be used. The second pillar defines how the supervisory review should be organised in order to guarantee that internal processes and controls are properly implemented. It also covers risk types not present in the first pillar. The third pillar refers to disclosures that are required from banks in order to provide the general public with information concerning the implementation of this framework. It should be noted that banks implement country specific regulations based on Basel II rather than Basel II itself. Practice has shown that financial institutions use Basel II requirements/methods when rating their customers. Hence, although Basel II originally concerns financial institutions, it has high relevance for all kinds of sectors either for rating credit risks or by means of supply chains.